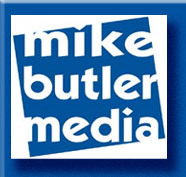 When an organization needs media materials or on-location production services for marketing, advertising, promotion, point-of-sale, corporate communications, financial reports, new product launches, recruiting or training, or other projects, mikebutlermedia.com is there to provide the elements. As a multimedia producer, Mike provides these specialized creative services for corporate clients in the US, UK and Canada. With decades of practical experience, we provide such services as: Audio-Video Production, Presentation Services, Marketing Support, Creative Research, Graphic Design, Photography, and other services also through our wholly-owned subsidiaries Cat Scratch Studio and Music by DJ Michael Butler. "Just wanted to tell you how impressed I was with the whole production team (and content) of the National Sales Meeting; it was AWESOME! I felt like one night I was at a rock concert and then another night at the Emmys. You did a terrific job"